Stock photo of two tourists admiring the bright red tulips and the historic Prince of Wales Hotel (built in 1864) in spring, Niagara-on-the-Lake, Ontario, Canada. 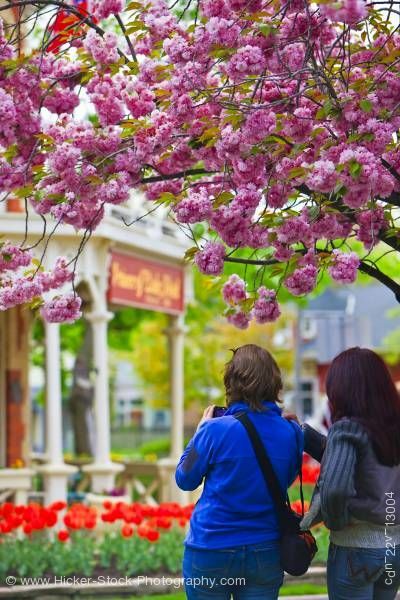 This stock photo shows a couple of tourists admiring the colorful red tulips and the historic Prince of Wales Hotel (built in 1864), Niagara-on-the-Lake, Ontario, Canada. The tourists stand under a beautiful pink flowering tree while photographing the historic Prince of Wales Hotel entrance and its sign on the front with its beautiful landscape of brilliant red tulips. Behind the hotel are trees with the changing autumn colors and additional store fronts add to the background. The woman with the camera is wearing a royal blue jacket has a camera bag and purse hung over her shoulder. The other wears a gray blue jacket. Both have their backs to this photograph. Tourists admiring the colorful Tulips, Tulipa, and the historic Prince of Wales Hotel (built in 1864), Niagara-on-the-Lake, Ontario, Canada.